Joanna is an excellent host and helped if I had any questions. Room was well very clean and well equipped. I had my morning coffee at the bakery next to Elli and just loved it. Very clean rooms and very warm welcome by the owners. It is only 30-40 meters from the sea. The host it amazing and so welcoming. She made us feel so comfortable. Brilliant sea view and about 10m away from a fantastic bakery. Joanne is very kind and smart person, she was so helpful. She made a surprise for us and gave a present when we arrived. Zeer vriendelijke host, heel behulpzaam en heel gastvrij. Een hele lieve vrouw die alles doet voor de gasten. Appartement werd elke dag schoongemaakt, en was heel schoon. Alles was aanwezig in het appartement, zeer volledig inventaris. We mochten tot 14:00 in het appartement blijven na het uitchecken zodat we konden douchen na het strand, dit was heel fijn. Супер чистые апартаменты! Очень хорошая уборка каждый день + смена белья через день. Кухня оборудована всем необходимым для приготовления пищи: плитка, кастрюли, сковородки, чайник, кофеварка. Хозяйка позаботилась даже о соли и бутылочке масла. Приятно удивили чай, банка (!) растворимого кофе, печенье, джемы, мед в небольших упаковках. Также хозяйка сразу принесла сок, какие-то еще напитки. Во дворе растут деревья, в тени которых приятно посидеть в жару. Есть несколько столиков, а также летний душ. Все очень уютно и сделано с любовью. Наши апартаменты были на втором этаже, у нас был стол на улице, сушилка для белья, и большой стационарный зонт. Также в номере был складной зонт, который можно взять с собой на пляж. До моря с хорошим пляжем - 50м. В соседнем доме - отличная пекарня, куда можно ходить завтракать. Вдоль улицы много таверн, ресторанов, баров, магазинов. Но туристов немного. Posto meraviglioso. Appartamento bello e pulitissimo. La titolare squisita e disponibile. La gentillesse de Joanna, l'équipement global au top avec de multiples attentions tout au long du séjour. Un accueil à la grec dans la pure tradition du pays. Un must. 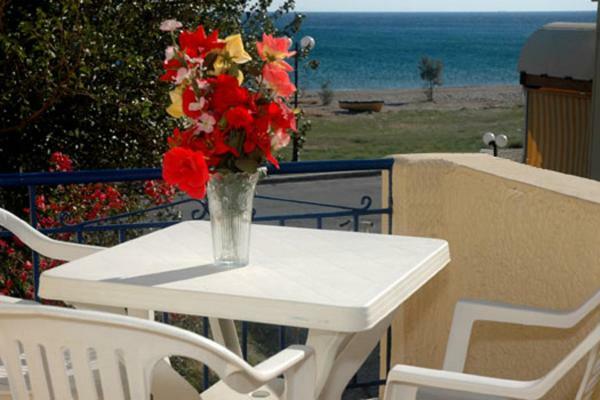 Lock in a great price for Elli Studios & Apartments – rated 9.8 by recent guests! Just 150 feet from the sandy Votsalakia Beach in Kampos Marathokampos village, Elli offers self-catered studios and apartments with free Wi-Fi and a furnished balcony overlooking the Aegean Sea. The units are equipped with air conditioning and TV. Each includes a kitchenette with a fridge, cooking hobs and a coffee maker. The rooms also have a backyard that faces the beach. Some of them also include portable fans. Studios Elli is within 30 feet from the local bakery and mini market. Kampos Marathokampos village offers a variety of taverns, bars and cafés. Vathy, the capital of Samos is 28 mi away. Pythagoreion Town and Samos Airport is at 23 mi. This property also has one of the top-rated locations in Marathokampos! Guests are happier about it compared to other properties in the area. 뀐 Located in the top-rated area in Marathokampos, this property has an excellent location score of 9.7! When would you like to stay at Elli Studios & Apartments? Featuring a balcony with sea view, this spacious studio offers a fully equipped kitchenette and private bathroom with shower. Offers free Wi-Fi. Linens and towels are changed twice a week. Offering a balcony with sea views, this spacious apartment includes a kitchenette with fridge, cooking hobs and coffee maker. Offers free Wi-Fi. Linens and towels are changed twice a week. There is no availability for an extra bed. Ολοι οι πελατες ειναι ευχαριστημενοι απο τις καταπληκτικες διακοπες τους. Ως υπευθυνη του καταλυματος ,αναλαμβανω την αμεση εξυπηρετηση των πελατων ,σε πληροφοριες σχετικα με την Σαμο ,και σε παροχες του καταλυματος Μετα το περας της εργασιας μου ,ασχολουμαι με την κολυμπιση , πεζοπορια κλπ. House Rules Elli Studios & Apartments takes special requests – add in the next step! Elli Studios &amp; Apartments accepts these cards and reserves the right to temporarily hold an amount prior to arrival. Elli Studios & Apartments accepts these cards and reserves the right to temporarily hold an amount prior to arrival.